Half Price Tours – This Week Only! Take advantage of this special student offer to book half-price tickets for 2 of Noosa’s best tours. Merricks’s Learn To Surf is one of the world’s best surf schools. Located on the famous Noosa main beach where the water is warm and waist deep, Learn To Surf offers safe, professional and fun surf lessons. Trained instructors use new technology soft surf boards and teaching techniques, providing you with your best ever chance to stand-up on the board. Make sure someone has a camera ready when you catch your very first wave! Boomerang Tours Hinterland Day Tour is fast getting a reputation for being one of Noosa’s best days out. Jump on board the Boomerang Tours air-conditioned bus, and head inland to the famous Eumundi Markets. Then onto Kondalilla National Park and Waterfall for a rock pool swim and a FREE sausage sizzle lunch. Next is Montville Mountain Village with over 100 craft shops, cafes and pubs. And lastly onto the Mary Cairncross Reserve for a rainforest walk to spot pademelons (small kangaroos), and a stunning view of the Glass House Mountains. Pick-up/drop off, lunch and all national park fees included. This special offer is only valid for tickets booked by 5pm on Friday 4 March at Tribal Travel. Open-dated tickets are valid for 3 months. 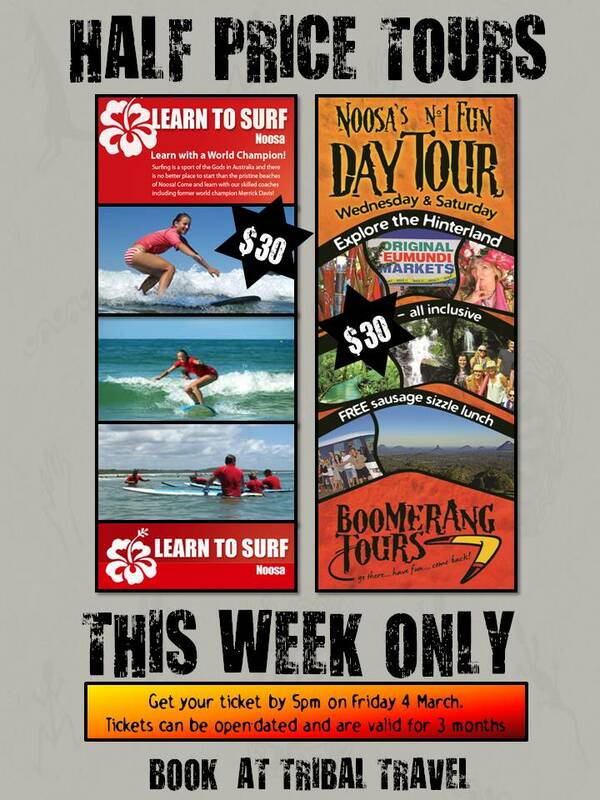 Don’t miss this opportunity to save $60 and have fun in Noosa! This entry was posted in Announcements, Student News, Student Travel & Tours by Lexis | Noosa. Bookmark the permalink.